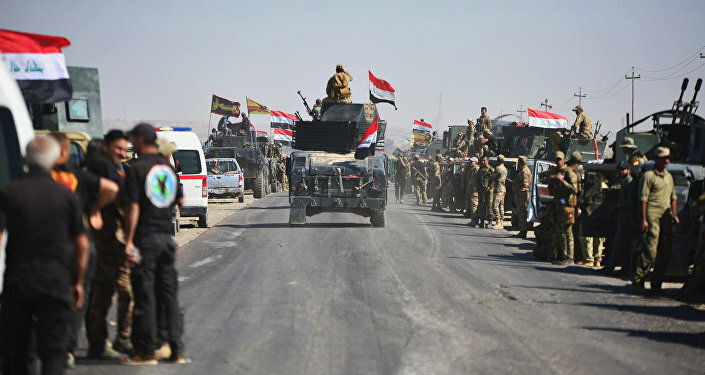 Amid the ongoing tensions between Iraqi military forces and Peshmerga in Kirkuk, the federal troops managed to establish control over the key region's facilities and governing bodies. The Iraqi federal police managed to capture the Kirkuk administration building without any fight, a source told Sputnik. According to the source, the majority of officials of the administration, including its governor Najmaddin Karim, left on Monday morning in the direction of the territory of the Kurdish autonomy. "Forces of the federal police entered the building of the provincial administration without any resistance," said a member of the provincial administration who was familiar with the situation. According to him, the federal forces took control of "other important objects" in the city. Media reports claim that Iraqi Prime Minister Haider Abadi ordered to raise Iraqi flag over Kirkuk and other disputed areas under the control of Kurds. The Rudaw broadcaster reported that Abadi has appointed Rakan Saeed Juburi as acting Kirkuk governor to replace Najmaldin Karim, who was removed from office after he advocated for the province's participation in the Kurdish independence referendum. Juburi has become the first Arab to head the province since 2003. Earlier on Monday, Iraqi forces gained control of the Kirkuk airport, the K-1 military base, two oil fields, as well as over Kirkuk's irrigation system. Abadi has ordered earlier in the day an operation to restore security in the disputed city. He said was fulfilling its constitutional duty and security of expanding federal authority. The deployment of Iraqi troops to the region was approved by the country's government after the Kurdish independence referendum on September 25, which was declared illegal by Baghdad. Kirkuk held the vote too, despite not being a part of Iraqi Kurdistan. In 2014, Peshmerga liberated the oil-rich province of Kirkuk from the terrorists of Daesh (banned in Russia). Since then, the region has been controlled by Kurdish authorities. The US-led coalition forces in Syria and Iraq called the recent exchange of fire between Iraqi government forces and Kurdish Peshmerga fighters a misunderstanding. "We believe the engagement this morning was a misunderstanding and not deliberate as two elements attempted to link up under limited visibility conditions. The Coalition strongly urges all sides to avoid escalatory actions," the statement said.